As we were leaving church on Sunday morning, we saw my nephew and his wife in the parking lot and they mentioned that they were heading to the Big Shanty Festival in Kennesaw that afternoon. We hadn’t heard of the festival, or planned to go, but Jo was curious and I thought that there might be fair food. We arrived about 11:00 and found that the festival didn’t start until noon. 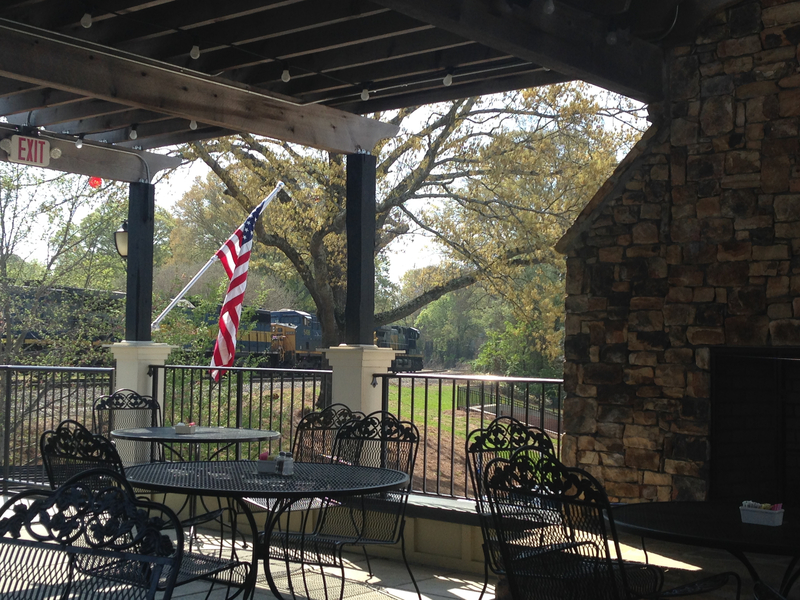 But we did see that Trackside Grill (a restaurant just down from Burger-Fi) was serving lunch, so we thought we’d eat, then see what there was to see. The menu looked great, unfortunately they were serving an extremely abbreviated menu, due to the festival. which was very thick and quite good, although the flatbread served with it was much more garlicky than I care for. 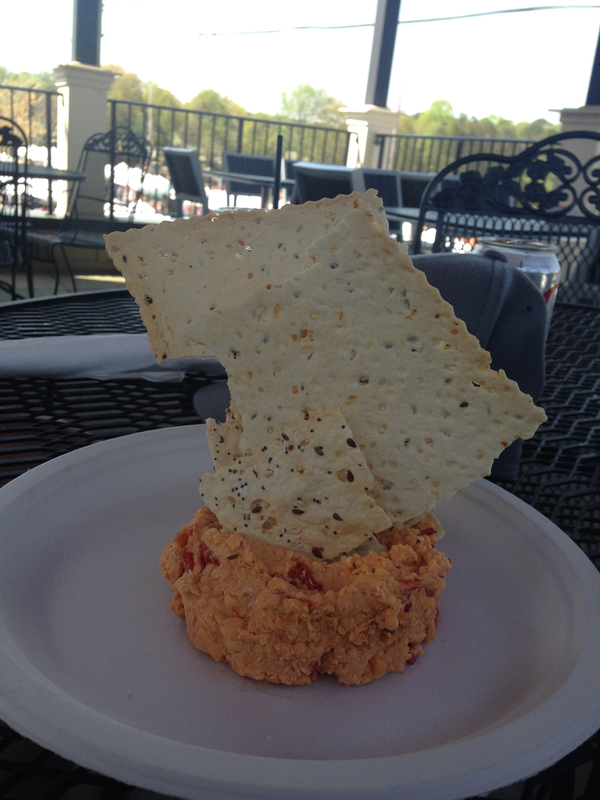 I ended up eating the pimiento cheese by itself, which was okay with me. 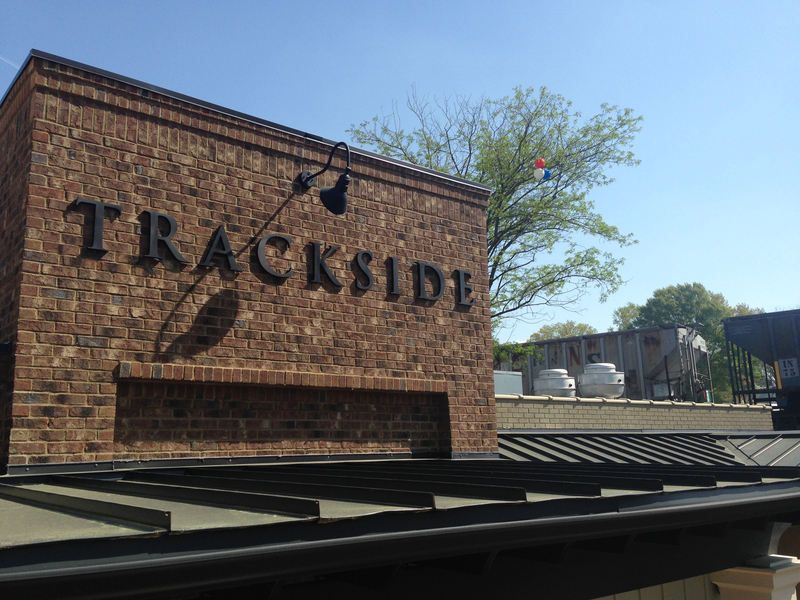 Trackside is an extremely appropriate name for the place, as we had six trains go by in the forty-five minutes that we were there. 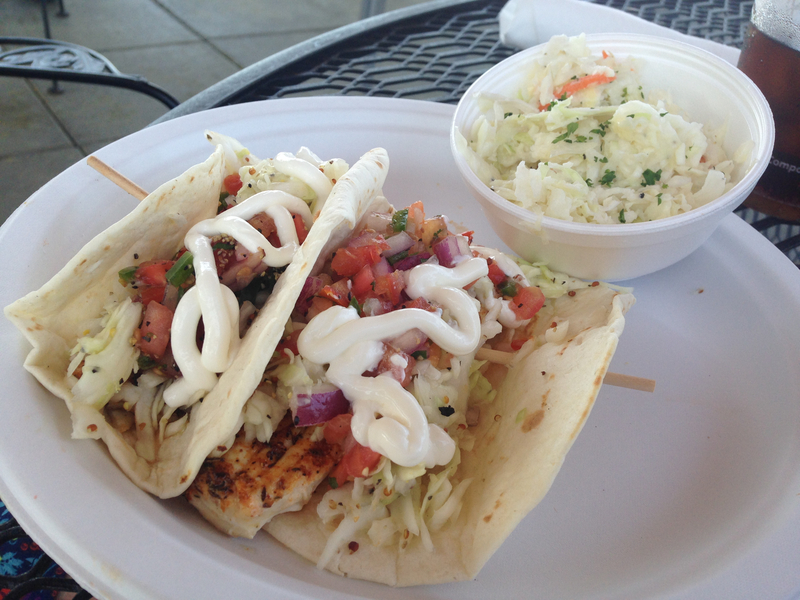 Jo decided on the fish tacos, which were blackened mahi mahi, topped with ginger lime slaw, pico de gallo and sour cream, with a side of their southern slaw. She asked about the slaw and was told that it was mayonnaise based, but it ended up being vinegar based and very good. The fish tacos were also very good, although they weren’t hot when they came to the table. I’d like to think it was because they were preparing to “serve the masses” at the festival, but the restaurant had only been open for fifteen minutes when we were seated. I was trying to decide between a burger and the barbecue sandwich and asked if they did the barbecue themselves. 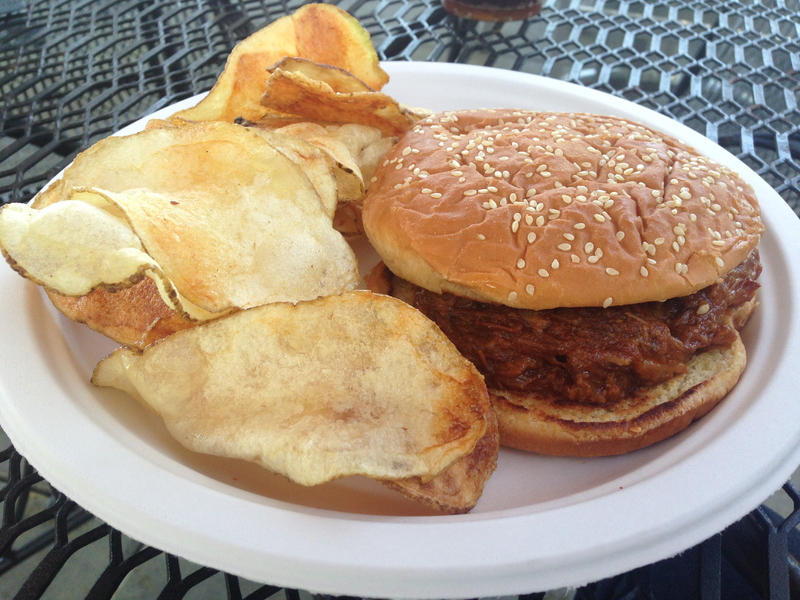 The answer was “yes”, so I went with the pulled pork sandwich, which was served with house made potato chips. There were no fries, due to the festival. Really? The sandwich arrived and the pork reminded me much more of what my mom makes in a crock pot, consistency wise, than anything I’ve ever seen come off of a pit. They say that it is hickory smoked (and that they use Sweet Baby Ray’s sauce – which was sweet, and good), but I didn’t taste any smoke. And the pork was so soaked in sauce, it was hard to see if there was a smoke ring. It was fine. In case you care, “fine” is a code word, in my household, for I would have rather had something / done something / gone somewhere else, but I could live with the choice. The house made chips were the size of entire potatoes, but they were cooked well. I don’t think it’s fair to write this place off entirely, based on the limited menu choices, so we’ll have to try them another day. On to the fair. Nice review! I chuckled at your explanation on the use of the word fine. Also, in my experience pork soaked in BBQ sauce is usually only done for one reason, to hide poorly cooked/smoked meat. Thanks, Mike. Sometimes they cover the pork in sauce because that’s “what they do”, but more often than not, your experience matches reality.